Bringing a horse into your life can be an incredibly rewarding and meaningful experience. Horses are beautiful and majestic creatures, and they provide a truly intimate level of companionship once they’ve made a connection with a person. No two horses are the same, and before long you will begin to pick up on and appreciate your horse’s unique personality. However, owning and caring for a horse comes with a great deal of responsibility as well. These are large and often temperamental animals that require day-to-day attention. Taking care of an equine is not a simple or easy task, and it is important to know what you are getting into before bringing a horse into your life. If you have recently purchased or leased a horse, or are considering buying a horse for your family, you will need to know certain things. 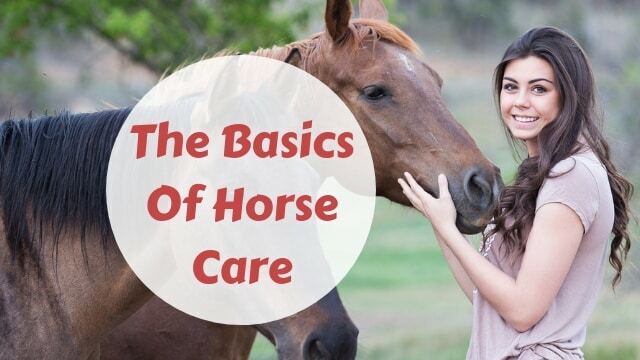 Let’s take a look at a few basic facts about horse care. While it probably won’t surprise you that horses need water, the amount they need daily might. On average, a horse can drink anywhere from 5 to 15 gallons every day. Expect your horse to drink more in the summer months, and be sure to check that your horse’s drinking water hasn’t frozen during the winter months. The water must always be clean, and it is recommended to check that your horse’s water supply is sanitary at least once a day. Dirty water can lead to numerous health issues. You’re also going to want to set up a water trough that is sturdy and can’t be tipped over easily. Horses should eat periodically throughout the day. While it may seem excessive at first, you’re going to want to make sure your horse almost always has soom food readily available. Horses need to eat around 1 to 2 percent of their body weight in food on a daily basis. Most fully grown horses weigh about 1,000 pounds, so that means your horse should be eating roughly 10 to 20 pounds of food every day. Horses’ diets mainly consist of roughage, or hay and pasture. Depending on the age and amount of physical activity your horse is getting on a day to day basis, you may want to include some grains or amino acid supplements into their diet. There are various dietary supplements available for horses, such as Equinety, that can improve muscle recovery and bone strength. Horses are very active animals, and the more time they spend outside the better. That being said, while horses are incredibly sturdy and capable of dealing with weather conditions that would prove to be seriously detrimental to humans, your horse is still going to need a spacious place to rest and shelter itself from extreme weather conditions. You may want to consider a run-in stable that will give your horse greater freedom to stretch its legs and lie down, as opposed to a more traditional stall that can be more confining. You should also routinely check your shelter’s floor to ensure it is dry, because horse hooves can be damaged by constant exposure to moisture. Every horse requires a vaccination against tetanus, and many other vaccinations are often recommended, depending on a variety of factors. It’s best to discuss vaccination options with your veterinarian. Your horse should also be periodically treated for worms, which can cause weight and hair loss, as well as diseases such as colic. Most worm treatments should be applied every six to eight weeks. It is also imperative to keep your horse, as well as its living space, as clean as possible. Maintaining a clean living environment will reduce your horse’s risk of coming into contact with harmful parasites. When it comes to cleaning your horse, brushes are essential. You’ll want to brush your horse every day. Be sure to use different brushes for different body parts, so as to avoid infections. Remember to be gentle as you brush, because some horses have more sensitive skin than others.